Wilhelm Richard Wagner (22 Mey 1813 in Leipzig – 13 Februar 1883 in Venice) wis an gey moyen German componer, muisic theorist, an essayist, maistlie kent for his grundbrakking symphonic-operas (or "music dramas"). His warks is byordinar for thair conteenous contrapuntal textur, rich harmonies an orchestration, an elaborate uiss o leitmotifs: themes pitten thegither wi parteeclar chairacters or seetiations. Wagner's chromatic muisical leid wis lik later oncomes in European classical muisic, includin unco chromaticism an atonality. He chynged muisical thocht throu his idea o Gesamtkunstwerk ("hail airt-wark"), epitomed bi his muckle fower-opera cycle Der Ring des Nibelungen (1876). His concep o leitmotif an integrated muisical expression wis a stieve fluence on monie 20t hunderyear film scores. 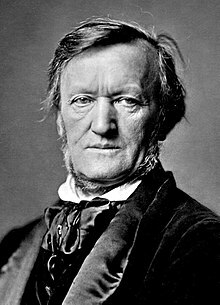 Forby Wagner is an unco controversial feegur, baith for his muisical an dramatic innovations, an for his unco public expression o anti-semitic ideas. Wikimedia Commons haes media relatit tae Richard Wagner.